This chart from the Heritage Foundation is just about as self-explanatory as anything can be about the threats we face as a nation in our federal over-spending proclivities and irresponsible non-action in Congress and the White House to arrest the accumulation of more exorbitant debt. 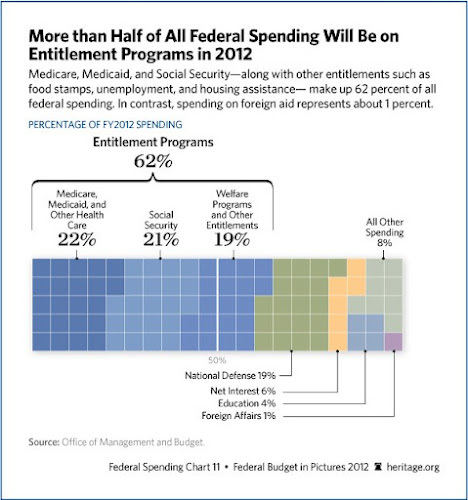 62% of our federal budget is now being spent on entitlement programs. Not defense. Not 'feriegn aid' as it is known in the South. Not education. Not road construction. And you want to know the really weird thing? Well over 50% of the American public doesn't think they have ever used or benefited from a US Federal Entitlement Program! Well, someone is using those programs, aren't they? Each year, another block in the chart above gets filled in with blue with another entitlement commitment such as by some provision of the Medicare Part D prescription benefit program passed under W or The Affordable Health Care Act passed under Obama. Why should a progressive liberal be concerned about these budget trends? Because all of the 'discretionary' programs progressive liberals would love to see continued are being nibbled to death by ducks as each mandatory program such as Social Security, Medicare and Medicare continues to chew up more and more of scarce available resources at the local, state and federal level. 'Fiscal' conservatives don't mind that attrition in discretionary programs as much. They 'want' smaller, less intrusive government...supposedly. Unless it is in any defense program or some local road construction or agricultural support program that benefits their constituents. Then it becomes a 'vital national program! For the life of us, we can't figure out why progressive liberals are not all fiscal hawks. 2) Humongous amounts of wasteful spending is still going to programs that were created either before World War II to solve the problems America faced after the First World War! Either that or current funds are spent by the hundreds of millions of dollars to support jobs in a congressional district that were established by some long-gone defense appropriations committee chairman who went on to the Great Beyond decades ago and his successors have successfully kept such unwanted and unnecessary programs going for no reason other than political incumbency protection. 3) Hundreds of millions of dollars get spent each year on federal programs that do not receive the proper oversight from congressional committees and have out-lived their usefulness and purpose. No one even knows if they are working or not to alleviate the pain and suffering they were intended to eradicate in the first place. The political reporter and I almost fell off our chairs to the floor. We have simply never heard such rational reasonable talk in our 35+ years of being involved with the federal electoral process. There is hope for America at least. People need to take a strong hard look at this chart above and memorize it and then all sides; progressive liberals, fiscal conservatives and socially libertarian/fiscally conservative Independents need to band together to support like-minded candidates to run for Congress, the state houses and the local governments so we can put our house back in order. The people who have been in office from all parties for the past 12 years at the very minimum have not done their jobs. Time to replace them all with some adults who will do their jobs. it don't make no sense for anyone, progressive liberal or right-wing conservative to oppose any means-testing of any wealthy person for any SS or Medicare benefit they do not need! The Caesars of Rome and Czars of Russia must be laughing in their graves at us stupid Americans where the middle class people paying payroll taxes are actually subsidizing the retirement (SS) and medical (Medicare) benefits of people like Warren Buffett who are wealthier than King Midas of King Croesus ever dreamed of being!